My 7th grade science teacher had a knack for analogies. To explain the difference between a compound and a mixture, he made brownies. Brownies represented a compound; the ingredients, after the baking process, become indistinguishable, and impossible to separate. Flour, sugar, cocoa powder, butter and eggs transform into this treat that is all of the ingredients but none of them. In a sort of alchemy, even the simplest ingredients can become something wonderful with a little heat, a little attention. You may think you hate anchovies. I get it. Those slimy little filets are not my cup of tea either. But when anchovy paste cooks down in a full-bodied olive oil, it becomes a nutty, savory sauce. The anchovy-haters in your house will have no idea what they are eating, they will just know they love it. The fragrant anchovy and garlic mixture that coats this pasta will linger in the air, it will make your kitchen smell like the North End of Boston. It’s a smell I’m going to miss. Every night, on my way home from work, all of the prep cooks are in their Hanover Street kitchens sauteing and chopping and the smell of garlic fills the air. My mouth waters, and I’m hungry the minute I walk in the door of the apartment. Maybe this move will be good for my waistline. The last time we moved, I scrounged up this Bacon Pepper Pasta with the crumbs from the cupboards. This pasta dish is similar in its simplicity. Just a few ingredients, those that linger in the fridge when you haven’t managed to get to the store in a while. 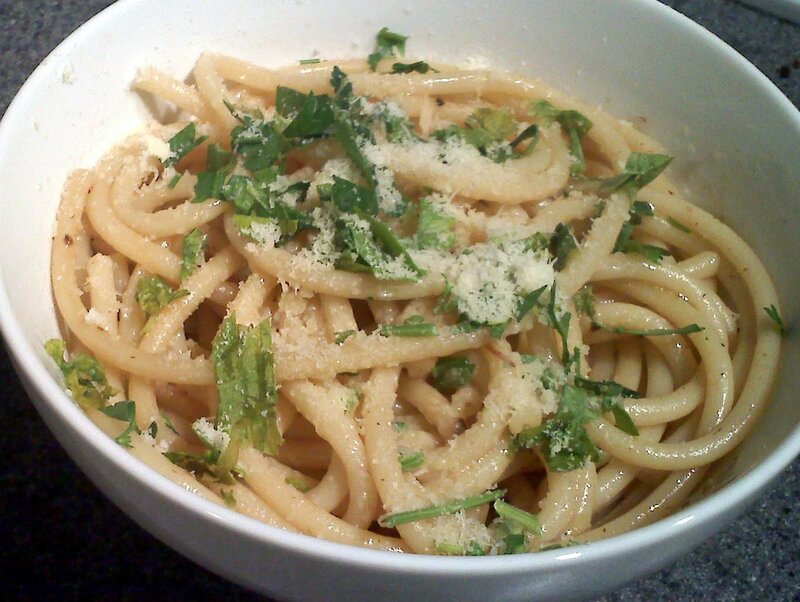 You can use linguine or spaghetti if you don’t have bucatini, but I love the toothsome bite of the hollow noodles. And I love that they are so difficult to twirl, so slurpy and messy to eat. Please forgive me if I don’t manage to post in the next week or two. It might take me that long to find my knives and roasting pans in this mess of boxes. Cook the pasta in plenty of boiling salted water until just al dente. Reserve 1 cup of pasta cooking water before draining the pasta. Meanwhile, over medium-low heat, heat the oil in a large saute pan. Add the garlic and anchovy paste and cook, stirring, until the garlic begins to brown. Add the pepper flakes if using. Add in the pasta, reserved water, and cheese and toss well to combine, cooking another minute or so. Add the parsley and salt and pepper to taste. Serve with additional cheese at the table. Jeff insists that there is a world of difference between a ‘vacation’ and a ‘trip’. And he’s right. According to Jeff, a vacation involves a beach, some sunblock, and a drink with an umbrella in it. A trip is just about anything else. A vacation is about pure relaxation. A trip, on the other hand, could involve visiting family, exploring a new city, or even work. But in the world according to Jeff, it has been a long time since we have had a vacation. Which may be why I have been dreaming of Hawaii. I loved everything about Maui when we went a few years ago. Pretty beaches, colorful fish, amazing hikes. But most of all I loved the fusion of flavors. The variety of influences, the quirky allegiance to retro ingredients, the fresh produce, and the long culinary heritage combine to form a unique food scene. So when the folks at Kings Hawaiian Bread asked me to come up with a creative brunch spread using their round bread, it seemed totally natural to cross cultures. Living here in the North End of Boston, with Italian pastry shops on every corner and the smell of garlic in the air, bruschetta is always on my mind. And it’s fantastic anytime of day, with a variety of toppings. 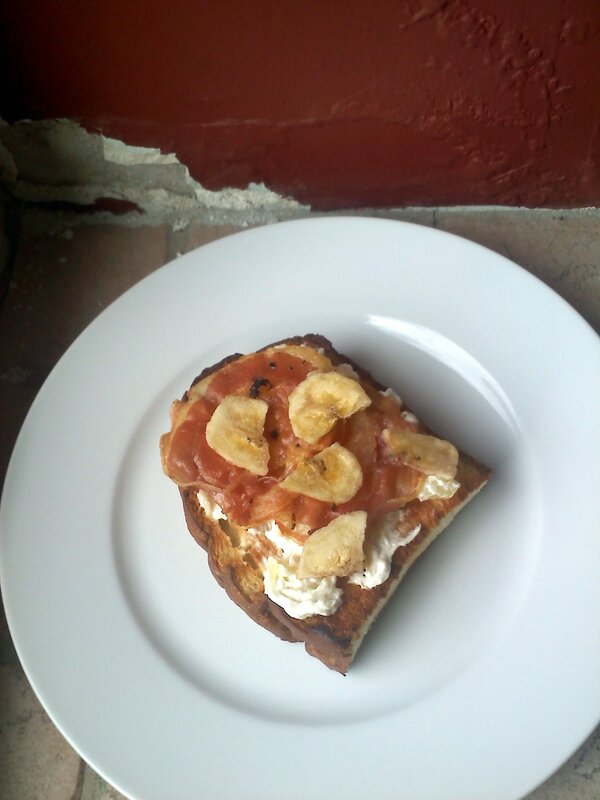 The rich, sweet flavor of Kings Hawaiian bread is a fantastic foil for all things spicy, sweet, creamy and savory. So I went for all of the above. 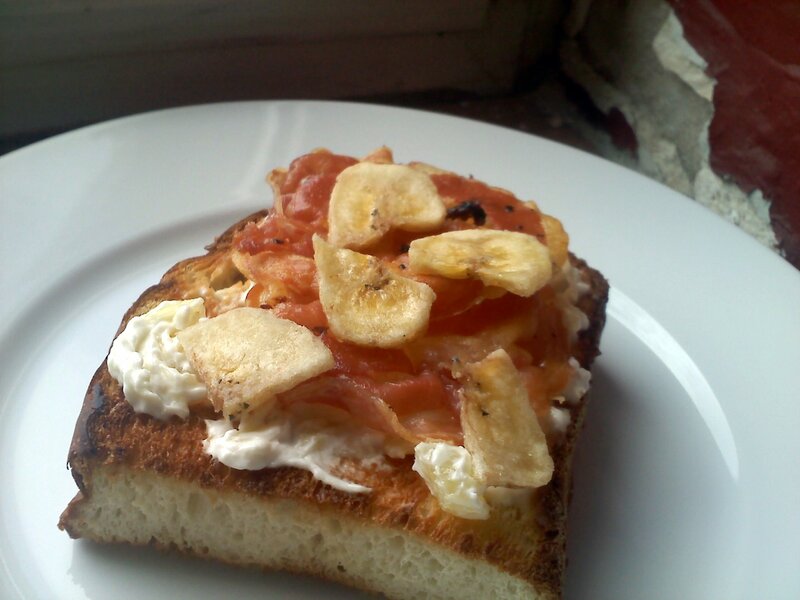 The variety of toppings made for a fun brunch spread – and would be great for a crowd. Round out the meal with a big bowl of fresh fruit salad, a little dish of macadamia nuts, and plenty of Kona coffee and you’ve got yourself a party. Brunch entertaining is the way to go. Easy, fun, and inexpensive. 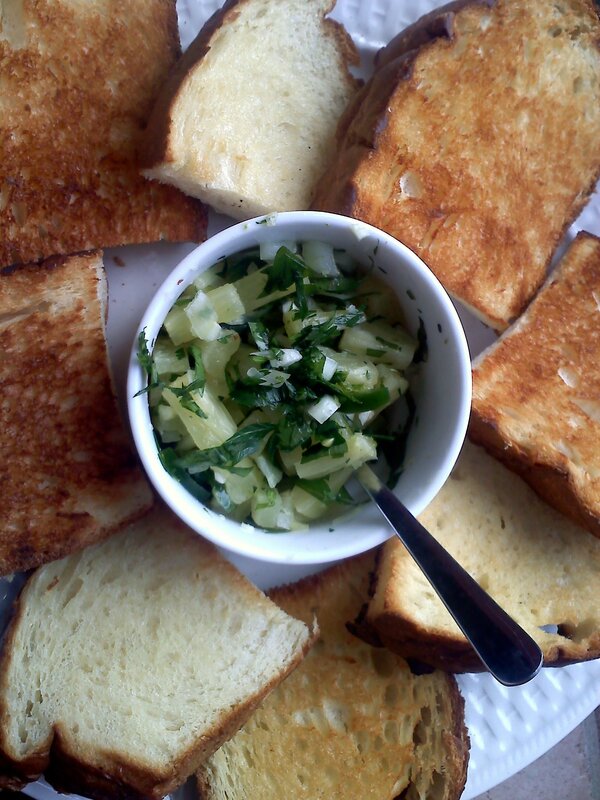 I love this pineapple salsa – it would be as great on grilled fish as it is on toasty, buttery bread. And who knew that pancetta and pineapple were a match made in heaven? The mild cream cheese, sweet pineapple, salty pancetta and crunchy banana chips are an unlikely, but exciting combination. 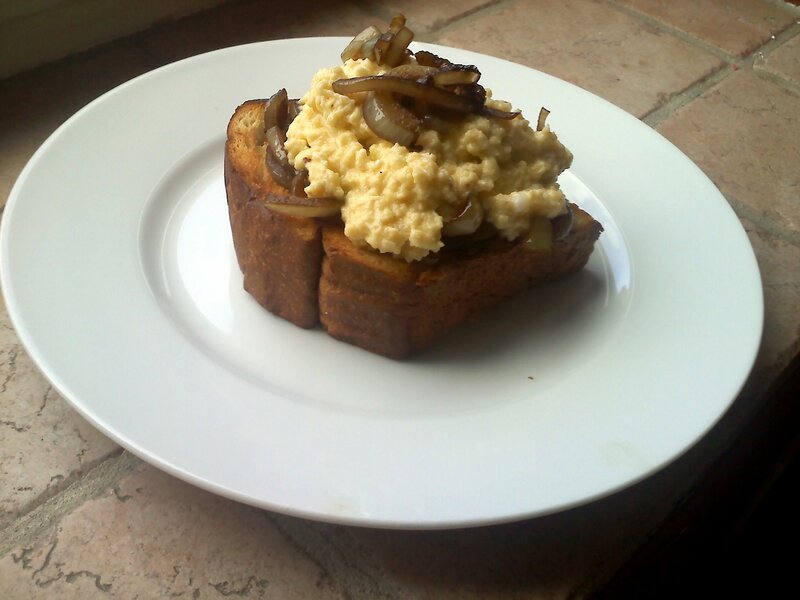 Soft scrambled eggs, parmesan cheese, and Maui onions are a no-brainer, but the Hawaiian bread makes all the difference. The sweet, soft bread turns simple eggs into decadence. It wouldn’t be Hawaiian without some pork, would it? The quick teriyaki sauce on this ham is salty, spicy, sweet and intense. Sliced thinly, this makes a fantastic bruschetta topping, but you could buy Kings Hawaiian rolls instead, cut the ham in thick chunks, and make some wonderful warm sandwiches. Cut the bread slices in half so that you have 4 smaller pieces. Spray the bread with cooking spray and grill in a cast iron pan or on a griddle over medium heat until slightly browned. 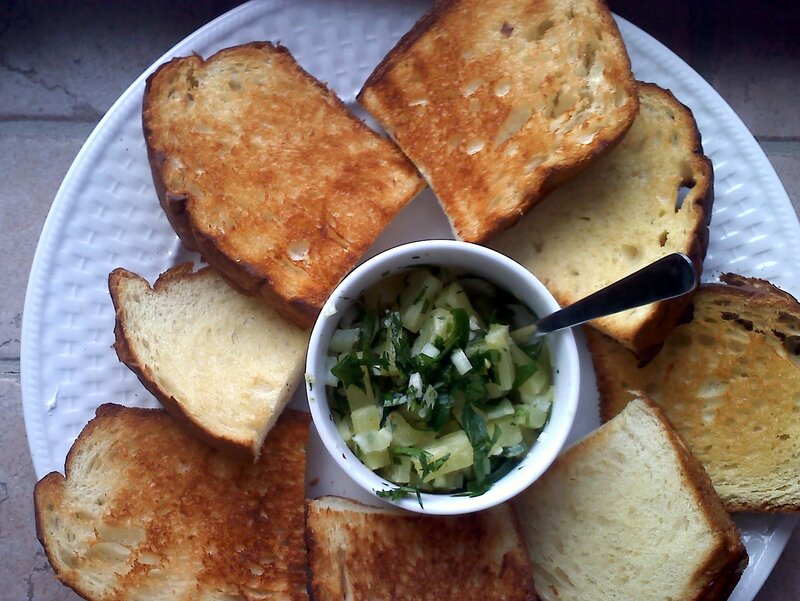 Mix together the pineapple, onion, jalapeno, parsley, and lime juice. Add salt and pepper to taste. Serve the bread with the salsa topping. Cut the bread slices in half so that you have 4 smaller pieces. Spray the bread with cooking spray and grill in a cast iron pan or on a griddle over medium heat until slightly browned. Meanwhile, whip the cream cheese with the pineapple. Cook the pancetta in a skillet over medium heat until slightly crisp. 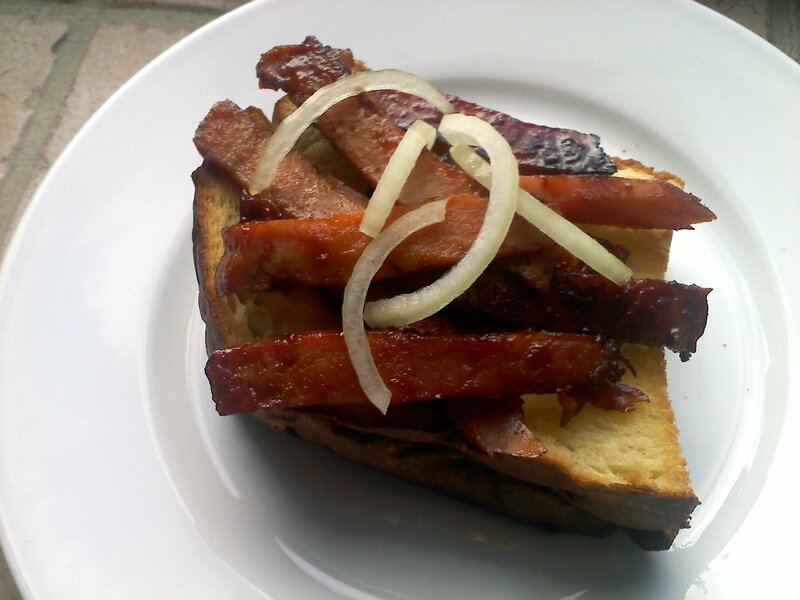 Spread the cream cheese mixture on the bread and top each with two pieces of pancetta. Sprinkle with banana chips. Cut the bread slices in half so that you have 4 smaller pieces. Spray the bread with cooking spray and grill in a cast iron pan or on a griddle over medium heat until slightly browned. Melt half the butter in a large skillet over medium heat. Saute the onion until very soft, about 15 minutes. Add the vinegar and cook another 3 minutes more. Season with salt to taste. In another skillet, melt the remaining butter over low heat. Beat the eggs with the milk. Add the eggs to the skillet and stir continuously for about 5 minutes creamy scrambled eggs. When the eggs are almost set, stir in the cheese. Top the bread slices with the onion and the eggs. Cut the bread slices in half so that you have 4 smaller pieces. Spray the bread with cooking spray and grill in a cast iron pan or on a griddle over medium heat until slightly browned. Meanwhile, in a small saucepan over medium heat, cook the pineapple juice, lime juice, zest, soy sauce, and chili sauce until reduced by half. In a large saute pan, heat the oil over medium heat. Add the ham steak and cook until slightly brown, flip and cook another 2 minutes to brown on both sides. Add the sauce to the pan with the ham steak and cook over low heat, turning the ham and swirling the pan every so often for about 10 minutes, until most of the sauce has cooked away. Remove the ham from the pan and slice very thin. Arrange the ham on the bread and garnish with onion if desired. 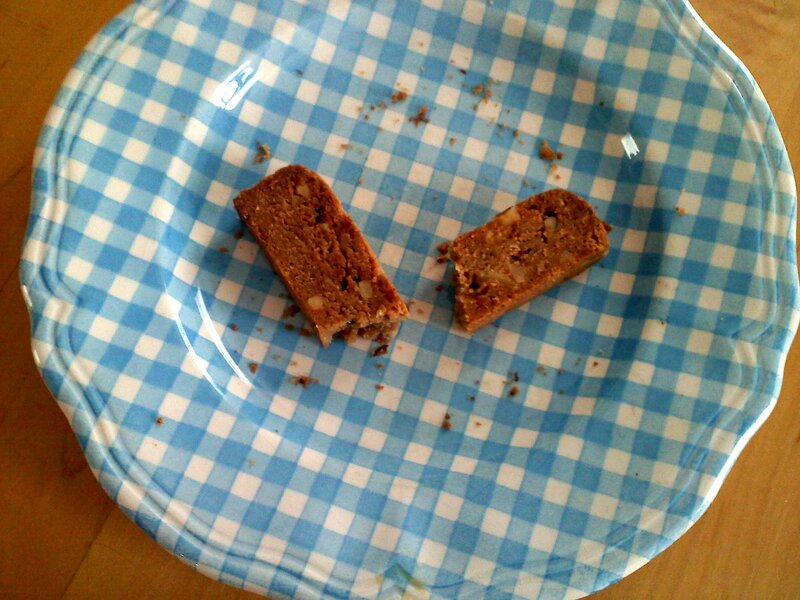 After I made chestnut biscotti last week, I still had some chestnut flour left. The sweet and nutty flavor gave me the itch to experiment. It turns out that chestnut flour is lovely in sweet treats, and equally as nice in savory preparations. But it’s absolutely amazing in sweet and savory dishes. The saltiness of the gorgonzola, the richness of the walnuts, the tartness of the apple and the sweetness of the honey bring out the unique earthiness of the chestnut in the crust. Since chestnut flour, unlike almond flour or other nut flours, is not especially high in fat, the texture of this crust is less crumbly and more crisp than a usual flakey dough. But I think that it adds to the heartiness of the dish. 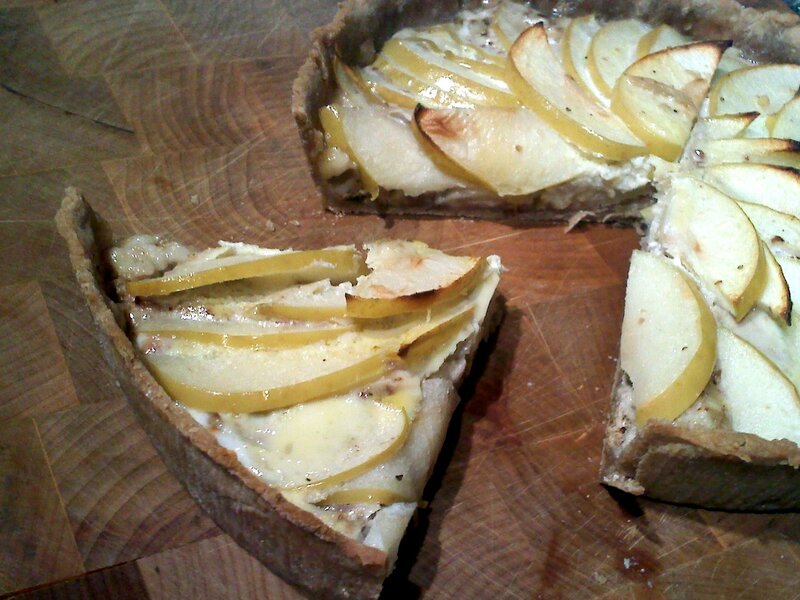 I’m loving this tart for dinner with a big green salad, but it would be great as part of a brunch spread. And I’m going to go have another slice. Right now. Preheat the oven to 350 degrees. In a food processor, pulse the flours, butter and salt. Add the water and pulse until the dough just starts to come together. Turn out the dough on a floured surface and knead lightly just until the dough comes together. Roll out to a circle about 9 inches in diameter. Transfer the crust to a greased 8-inch tart or quiche pan. In a medium bowl, mix together the nuts, cheese, and eggs. Spread the mixture in the crust. Slice the apple into very thin wedges. 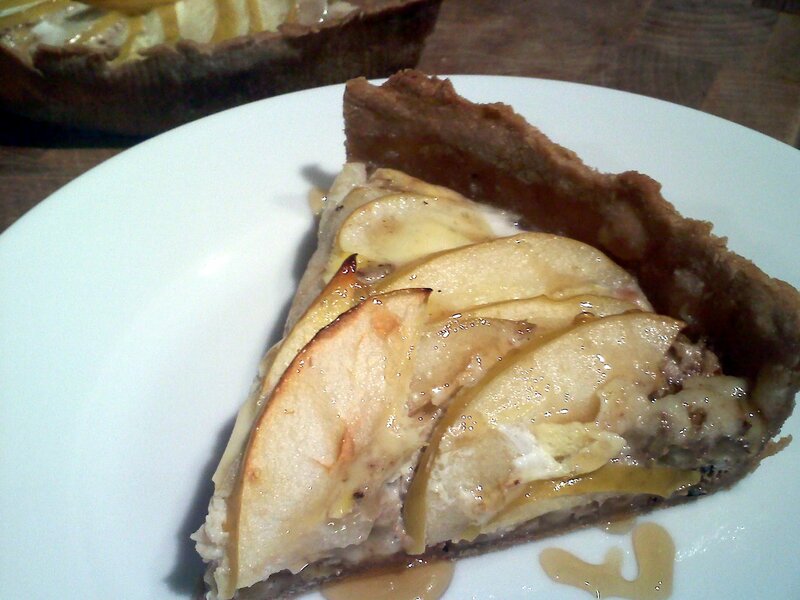 Arrange the apple slices on the tart. 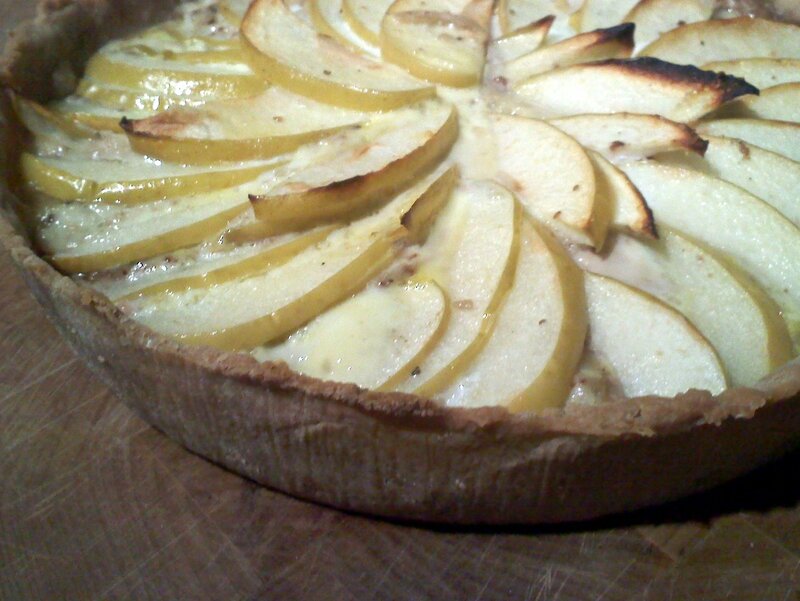 Bake the tart in the middle of the oven for about 30 minutes. Drizzle with honey and serve warm. It occurred to me today that I should get as much mileage out of my cute wool sweater dresses and soft cashmere scarves as possible. Only a few weeks left of weather cold enough for fuzzy boots to be considered a fashion statement! And only a few weeks for enjoying steaming winter stews, or curling up in front of a fireplace with a cup of cocoa. I’m excited for spring of course. For daffodils, asparagus, open-toed shoes, and lemonade. But as much as I’ve whined about the constant snow this winter, I feel a need to make these last few weeks count. So I’m bingeing on steaming soups and hot beverages. 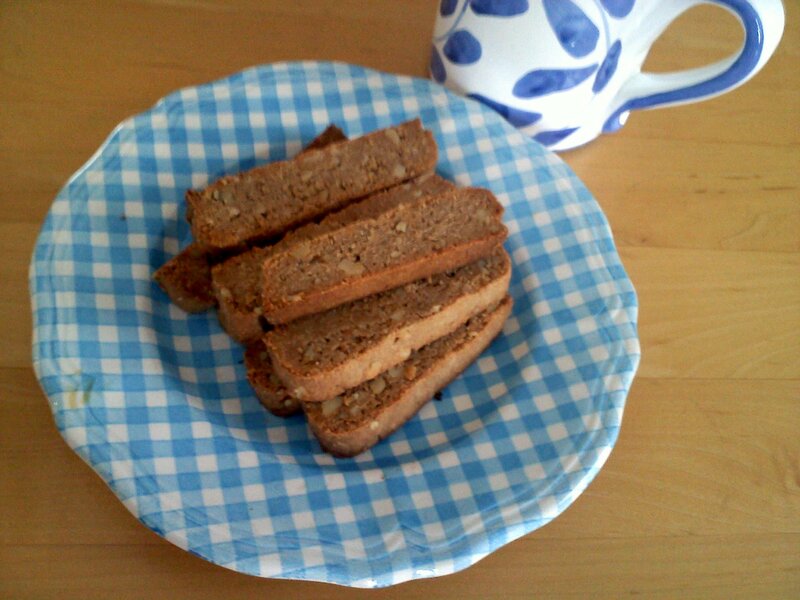 And to go with those beverages, nutty biscotti. Chestnuts are the ultimate winter ingredient, conjuring images of cozy holidays. And they add a rustic sweetness to these simple crumbly cookies. This recipe is actually more a riff on my grandmother’s mondel bread than an actual biscotti, but a twice-baked cookie is a twice-baked cookie. But don’t let the double baking process put you off, these biscotti are actually quite quick and easy, and perfect for dunking in a cup of coffee! Chestnut flour is often available at Italian markets, as it’s popular in European pastries, but you can also find it online. The flavor of chestnut flour is quite unique, but in a pinch, you could substitute almond flour. Preheat the oven to 350 degrees. Wisk together the egg, sugar, oil and vanilla. Sift together the flours and baking powder. Add the flour mixture to the egg mixture and stir to combine. Stir in the nuts. The mixture should be rather stiff. Form the mixture into two logs, each about three inches wide and one inch thick. Bake the logs on a greased cookie sheet for 35 minutes. Remove from the oven and allow to cool for 5 minutes, then slice carefully with a very sharp knife into 1 inch thick cookies. Replace the cookies on the cookie sheet, cut side down and return to the oven. Cook for 15 minutes more until they darken slightly. Cool completely and store in an airtight container. They last for at least a week and also freeze well. My mother hates beets. And until I was in graduate school, and a friend served roasted beets at a dinner party, I thought I hated them too. Turns out I absolutely adore beets. She also hates olives, so I maintained that I did as well, and didn’t eat one until a high school trip to France, where I discovered the beauty of little Nicoise olives. I was lucky, though, I suppose. My mother made most foods exciting, even healthy ones. Pulling apart artichokes was a fantastic game to get the heart, eating broccoli was devouring tasty little trees. One of my mother’s favorite meals is a simple baked sweet potato slathered with good butter. And her enthusiasm was catching. We had no idea that the sweet, orange flesh was healthy, we just knew that we loved it. And while I generally believe that sweet potatoes need no adornment other than a pat of butter, the mild sweetness actually works as a wonderful foil for all sorts of flavors. So when I saw that the NC Sweet Potato Commission was looking for bloggers to come up with recipes, my mind began to whir. I love the contrast of sweet and salty, and took that as inspiration for these gnocchi. They are rich and pungent but light and sweet. Truffle oil is rarely a bad idea, but in this case it is especially exciting, bringing a deep savory essence to the sweetness of the gnocchi. The higher water content of sweet potatoes makes for a more doughy gnocchi, but I love that extra chewy bite, as it seems a bit heartier. With so many flavors, so much depth, these gnocchi are a wonderful main course all on their own. They are impressive and beautiful enough to serve for a special occasion, but aren’t actually difficult to make. And you can even prepare the dough in advance. 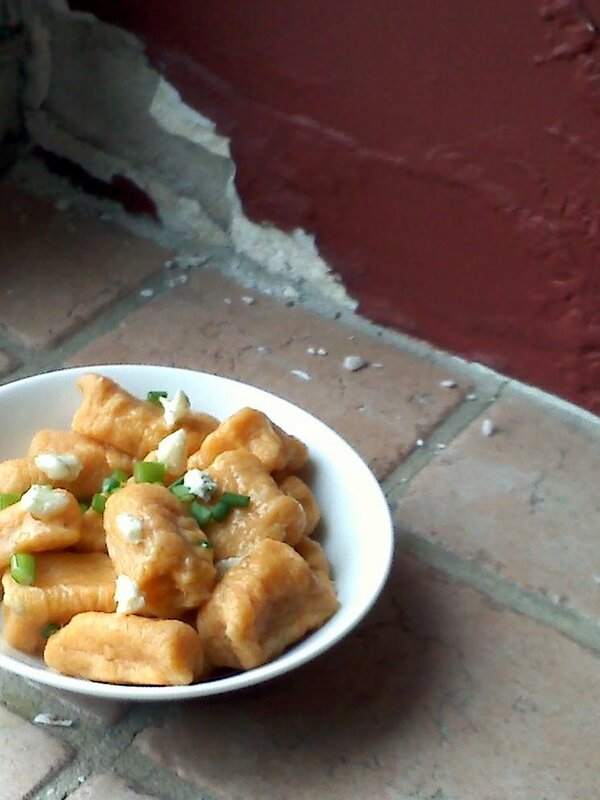 If you haven’t attempted gnocchi, give these a try, it’s easier than you think. And while rolling pretty little ridges into your gnocchi takes some practice, if they are crooked or off center or simply not there at all, I can promise you that nobody will notice once they taste them. Preheat the oven to 375 degrees. Prick the sweet potatoes all over, place on a baking sheet and bake 50-60 minutes until tender. Cool, peel and mash in a large bowl. Stir in the eggs. 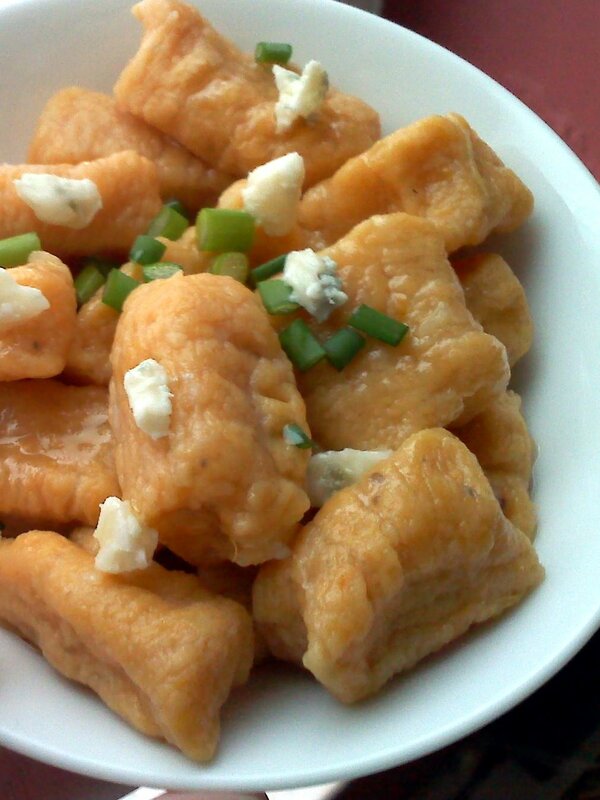 Reserve 4 tablespoons crumbled gorgonzola dulce and stir the remainder into the sweet potato mixture. Add the flour 1/2 cup at a time, stirring well to combine. Add a few pinches of salt and plenty of freshly ground black pepper. Divide the dough into four portions. Turn out one portion on a floured surface. Knead lightly, and then roll out the dough into a long rope about one inch thick. Cut the rope into 1-inch portions. If you want, you can then roll the gnocchi on a fork to create ridges. Repeat with the remaining dough. (At this point, the gnocchi can be frozen in a single layer on a wax-paper lined baking sheet and then transferred to a freezer-safe container for up to a month). Cook the gnocchi in a very large pot of boiling salted water. Once the gnocchi float to the top, boil for two minutes more, a total of about 5-6 minutes. Drain the gnocchi very well and divide among four plates. Sprinkle each plate with some of the reserved cheese, a bit of chives, and some additional black pepper. Drizzle each portion with truffle oil and serve right away.